Great news, everyone: I can see into the future! OK, that’s probably a bit (very) inaccurate. But I had so many future puns and jokes ready for this column this week I couldn’t pass that one up. While I may not be Kreskin, I have had the opportunity to sample some wines in a unique way, and I am thrilled to share some of the things I learned at a fun event. 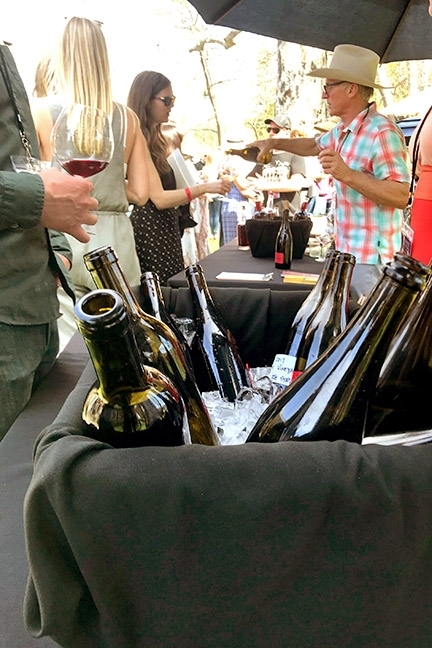 Events such as the 2019 Wine Futures in Solvang give people a chance to sample and pre-purchase wines that haven’t been bottled yet. The Santa Barbara Wine Futures Tasting, held on March 30 this year, allows wine lovers to have a chance to gaze into the future at some of their favorite local wineries. Wines are offered en primeur, which is a way of purchasing wines now that are not yet bottled or available for sale on the market. 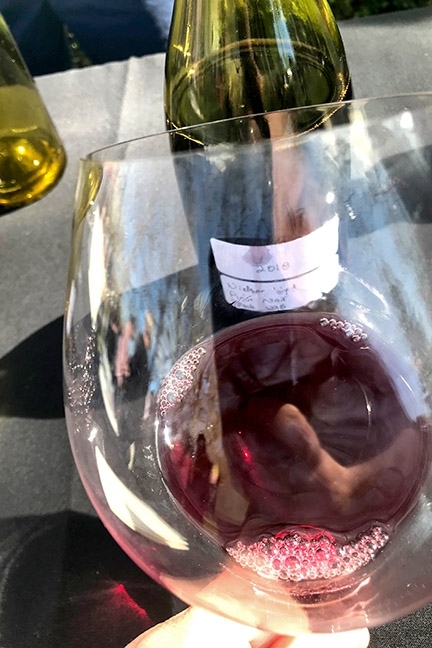 Most of the wines at the futures event (which featured more than 30 winemakers from Santa Barbara County) were pulled the morning of, or the day before, the event and bottled for sampling. So why are events like this popular with wine lovers and winemakers? Depending on how it goes, it’s kind of a win-win financially for both. It’s a way for the winemaker to get an influx of cash or funding before the wines are actually on the market. And shoppers (especially those who curate bigger collections) have a way of getting their hands on wine at a lower price than when it will be officially released. Also, it’s a great way to get a sneak peek at some of your favorite winemakers’ upcoming releases. For more information on the Santa Barbara Vintners and other wine events, visit sbcountywines.com. Jonathan Nagy of Byron Wines was one of the winemakers on hand pouring samples and talking about his wines. Nagy came to Byron in 2001 and is committed to making site-specific wines such as pinot noir and chardonnay. 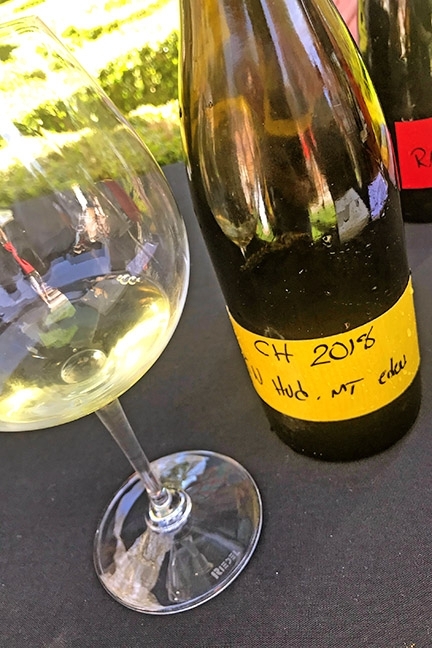 One of the wines he featured was the 2018 Byron chardonnay from Bien Nacido Vineyard Block L, and I have to say it was one of the best wines I had of the day. 'En primeur' events, also known as wine futures, are a way of buying wine early in order to get a discounted price. Wines are sampled at anywhere from six months to 18 months before the official release date, giving buyers a chance to see if they want to purchase it before the general public. Byron was founded in 1984, and Nagy’s ongoing mission is to continue with the winery’s original charter of making site-expressive wines from its historic vineyard as well as other local blocks. Nagy said winemakers at Byron taste their wines about once a month so they see the progression every year. That makes him comfortable showing wines such as the chardonnay as well as the 2018 pinot noir from Nielson Vineyard Block 122b. For its futures selection, Alma Rosa offered a 2018 chardonnay as well as a 2018 red Rhone blend. To give you an idea of why so many sharp-eyed wine connoisseurs flock to events such as this one, the red Rhone blend retails for $62, but shoppers had a chance to snap it up for less than $50 en primeur. Not too shabby for a discount, plus it’s a phenomenal wine. Winemakers, including Jonathan Nagy from Byron Cellars, participating in events such as the 2019 Wine Futures will offer their wines 'en primeur', before they are bottled or available for sale on the market. Founder Richard Sanford came to the Central Coast in the 1970s, drawn by the unique soils and climate. He started the region’s first certified organic vineyard and continues those practices of natural farming and winemaking to this day at Alma Rosa. The red Rhone blend is a rarity for the winemaker, but it seems to have worked out well. Complex with aromas of pink peppercorns, licorice, and meat, it was tasty and not too sweet. The winemakers at Alma Rosa suggest keeping it bottled for another three to five years, but I’m not sure I could wait that long. Another great winemaker with a beautiful backstory is Angela Osbourne of Tribute to Grace. The winemaker had two wines, both of them 2018 grenaches, at the Wine Futures tasting. Osbourne founded her winery in 2007 after she moved from New Zealand to California. Her dream was to make grenache, a wine that really can’t be grown in New Zealand because the climate is too cool (the grapes don’t properly ripen). Here in California, she found the perfect spot and named the wine after her grandmother Grace. The grenache from Via Caprice Vineyard is made using unique old-World techniques, including incorporating wild yeasts, whole clusters, and neutral woods. The wine is flavorful and vibrant, with hints of tobacco, cinnamon, and plums, and I definitely cannot wait to try more of it when it’s released next year. So while I might not actually be Kreskin (haven’t predicted those lottery numbers yet), I can tell you that the future of wine in Santa Barbara County looks promising. Especially from the peeks I had at it. Arts and Lifestyle Writer Rebecca Rose is the future. Contact her at rrose@santamariasun.com. 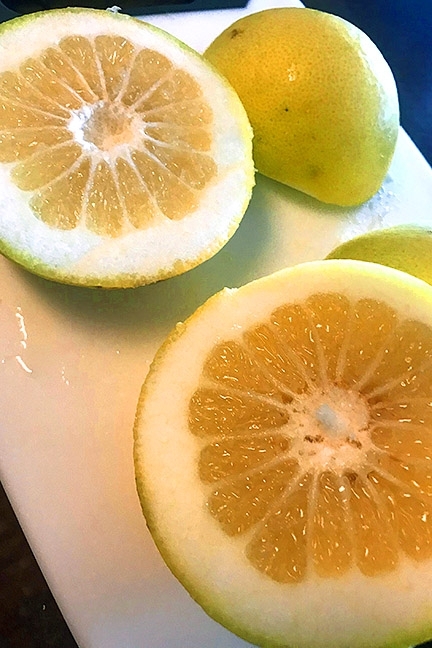 • We are on the tail end of the season for the beautiful and surprisingly sweet flavored oro blanco grapefruit. Grapefruit can be a daunting fruit for many (if you remember being forced to eat it as part of your nutritious breakfast growing up, you may be a little hesitant now), but the oro blanco is simply wonderful. It’s a great addition to a spinach salad, but who needs salad when you can have a vodka tonic? I add the juice of one oro blanco to a V&T and garnish with a wedge of the fruit. Now that’s what I call nutritious! Pick them up at your local farm stands or grocer while they’re still in season. • I stopped by Bell’s in Los Alamos over the weekend and was absolutely enchanted by everything. I was there when they first opened, and they have not missed a beat since. 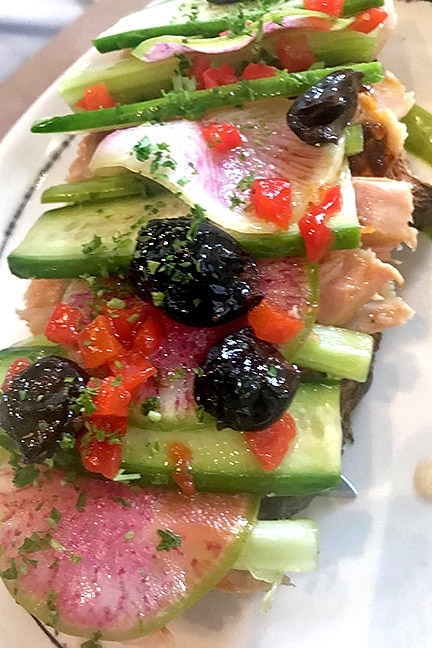 I could recommend everything (sardines and house-made saltine crackers are a really satisfying snack), but the tuna tartine for lunch is an especially beautiful and elegantly prepared dish. Try it for yourself at 406 Bell St.
• Trattoria Uliveto is still the place to go for your romantic date night dinners. We recently tried one of their specials, a sole with piccata sauce, and it was absolutely outstanding. Italian fish dishes are always superior to everything, and the chef at Uliveto really knows how to work with it. Treat yourself at 285 Broadway St., Orcutt. • May 3 at 6 p.m. is when Flying Goat Cellars will host its Decade of Decadence winemaker dinner at La Purisima Mission. Featuring winemaker Norm Yost, restaurateur Mitchell Sjerven, and the food of chef Greg Murphy, the event marks the 10th year Yost and Sjerven have hosted a dinner at the mission. Tickets are $150 for club members and $175 for non-members. Visit flyinggoatcellars.com for more information.